England’s bowlers simply had no answer to Virat Kohli. Picture: AFP. 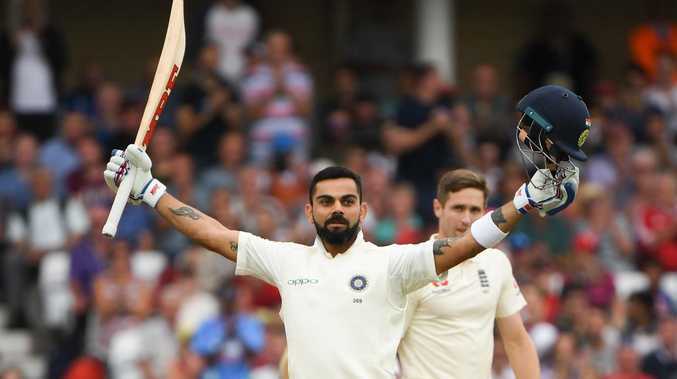 ENGLAND will need to set a record for the highest successful fourth-innings chase if they are to win the third Test against India after the dominant tourists declared at 7-352 with Virat Kohli making 103. England's opening pair of Alastair Cook and Keaton Jennings survived a tricky nine overs before the close of play, reaching 0-23. That means Joe Root's side require another 498 runs to win over the final two days of play and history suggests that is highly unlikely. Only four teams have scored more than 400 to win a test, West Indies' 418 to beat Australia in 2003 being the highest. The highest fourth-innings winning test total at Trent Bridge is 284 by England against New Zealand in 2004. Having started the third day on 2-124, India were barely troubled through two and a half sessions of steady, if unspectacular, accumulation under grey skies in Nottingham. After a fruitless morning session for England's bowling attack, Cheteshwar Pujara, who had been dropped in the morning on 40, was caught at first slip by Cook off the bowling of Ben Stokes for 72, ending his partnership with Kohli at 113. 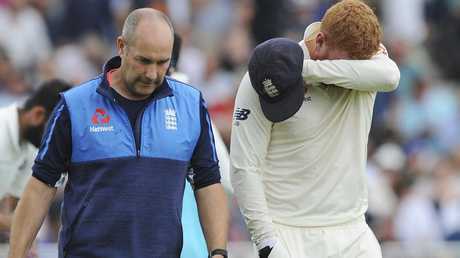 Jonny Bairstow is expected to bat despite a broken finger. Picture: AP. Skipper Kohli, who was out for 97 in the first innings, took few risks during his patient knock which finally came to an end after 197 balls when he was trapped lbw by seamer Chris Woakes. Hardik Pandya was unbeaten on 52 when Kohli finally decided to declare and let his bowlers give Cook and Jennings an uncomfortable mini-session. Bairstow, a key part of the home team's batting line-up, was hit on the end of the middle finger by a James Anderson delivery but is expected to bat in their second innings. England assistant coach Paul Farbrace said: "(Bairstow's) got a small fracture to the top of his finger but the doc's been trying to relieve a bit of the pressure on it and hopefully he should be able to bat."